Two amazing work-at-home mommies yesterday launched the biggest blog contest online to mark their simultaneous blog anniversary celebration this year. Dubbed as the Biggest Contest in the Blogniverse, Pehpot of Make or Break and Kaye of Random WAHM Thoughts, said cool cash and popularity await the lucky winners. A total of $500 in cash and hundreds of back links will be given away during the month-long contest. 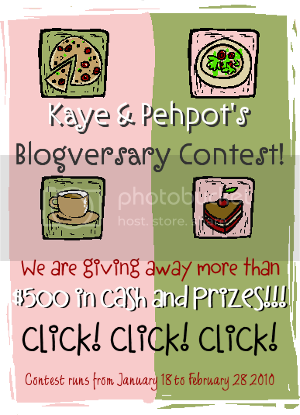 Bloggers extraordinaire, Pehpot and Kaye come up with the contest to give thanks to hundreds of people mostly maintaining a website or two, for following their respective sites and blogging careers in the past year(s). Pehpot is not the typical stay at home mommy who keeps her household neat and tidy, but a confessed-OCD and multi-tasker who maintains not one but 8 live blogs updated on a regular basis. Her blogs stimulate her creative juices she said. Kaye is a born writer. She also maintains a high profile blogging career and still has more productive time to attend to the needs of her family. Both have organized this exciting online contest where participants are sure to gain the cash prize at stake and back links from other participants who will join and review the sponsors’ sites. They urge everyone to check out the links to join the biggest contest this year which will run from January 18 to February 28. Here’s the teaser of what the winners will receive. This entry was posted in Uncategorized and tagged blog contest, friend on January 19, 2010 by Yami.